Most websites nowadays use a Content Management System (CMS) and most CMS-driven websites are powered by WordPress. Over 1/3 of the world’s websites run on WordPress. If your business has a website, it most likely runs on WordPress. In order to get the most out of your website, you and/or your staff need to learn how to use WordPress. If you are a website developer, you most likely build WordPress websites for your clients, so you need to train your clients how to use the websites you’ve built for them. When it comes to learning or training others to use WordPress, however, there are many challenges facing users and website developers. Some of these challenges include providing non-techies with comprehensive and detailed information in a way that they can understand and apply it, while answering all their questions and showing them step-by-step what to do. Creating all this information and keeping everything up-to-date is very time consuming. My name is Martin Aranovitch. I have been educating, teaching, and training businesses to use WordPress almost since the beginning of WordPress itself (you can learn more about me in the ‘About’ section). After years spent developing, testing, and documenting different WordPress learning and training methods, I am please to announce the most complete, practical, and cost-effective way to help businesses and non-techies use their WordPress sites effectively. The Complete Step-By-Step WordPress User Manual is unlike any other WordPress ‘How-To’ guide or training resource available. This manual has been written specifically to help businesses run by non-technical users learn how to use WordPress. 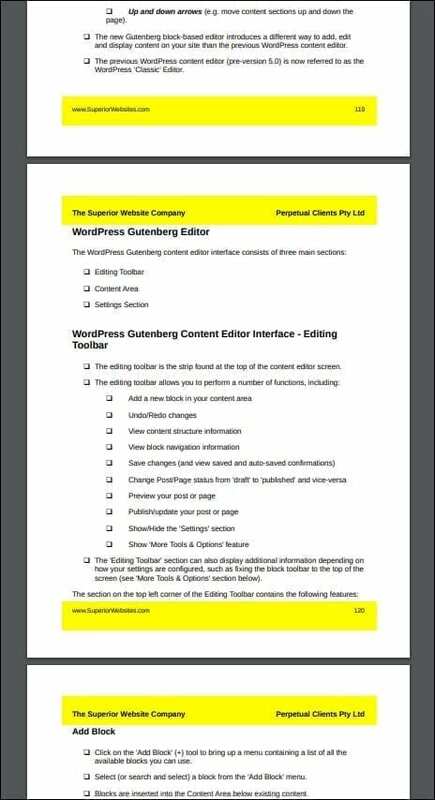 The Complete Step-By-Step WordPress User Manual is a comprehensive and fully documented 500+ page downloadable manual that includes hundreds of detailed step-by-step searchable and printable checklists, cheatsheets, tables and flowcharts. The manual is divided into 40 sections and flows in logical and sequential order, taking you step-by-step through everything you need to know to use your WordPress site effectively. Each chapter includes a ‘resources’ section containing links to detailed written and video tutorials if you need additional help or information about any of the features or topics covered in that section. Note: Resources included in the manual link to training websites that we manage, allowing us to keep the information regularly up-to-date. If your business uses WordPress, the first step to getting better results online is learning how to use your WordPress site effectively! Learn how to use your WordPress website. Train office staff, team members and colleagues to use WordPress more effectively. Take control of your web presence (if managing your own website). Better understand digital processes (if outsourcing the management of your website). 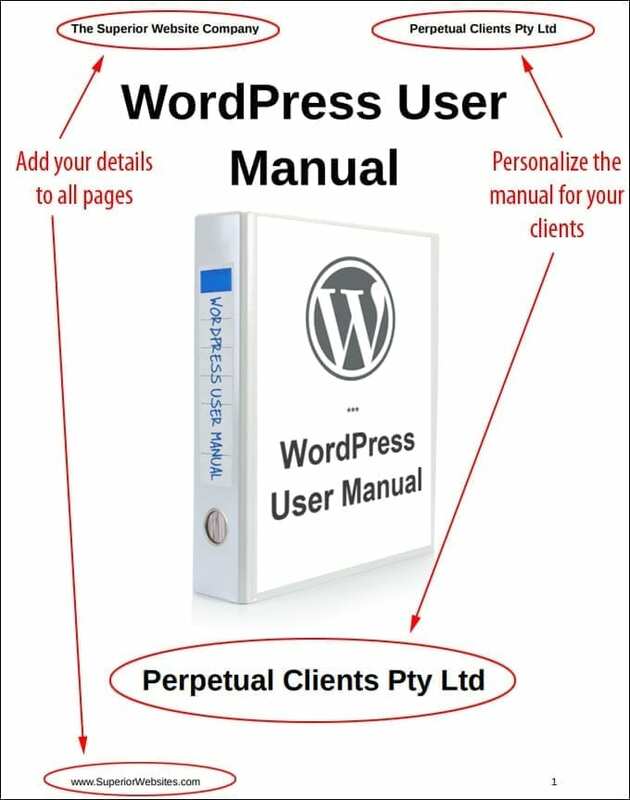 We offer a Rebrandable version of the WordPress User Manual that you can use to deliver comprehensive WordPress training to your clients, customers, or subscribers, personalized with your company name and website address and your client’s name. Provide clients, customers, and subscribers with a comprehensive personalized WordPress User Manual. Add value to your services, increase the value of your business, and give your business a competitive advantage. Provide an incentive for buyers to choose your services, upgrade to the next level, subscribe to your list, etc. 500+ pages of downloadable, searchable and printable WordPress user documentation. Quick access to comprehensive, detailed, and up-to-date information. Training content for teaching non-techies how to use a WordPress website effectively. Resources sections with links to detailed screenshot tutorials and video courses for additional help or information. 500+ page WordPress User Manual. Choose this option to download the complete manual as a searchable and printable PDF file. Choose this option if you provide WordPress services and want to rebrand the manual with your company details and client’s name. A unique and exclusive service that provides ‘done for you’ premium-quality lead generation and training content to help a limited number of WordPress website developers sell more services. Choose this option if you provide WordPress services and want ‘done for you’ lead generation and training content each month!